ساکس و وارنر (1995) با ارائه نظریه «نفرین منابع طبیعی» این ایده را مطرح کردند که کشورهای دارای منابع طبیعی غنی از رشد کمتری نسبت به کشورهای صاحب منابع کم برخوردارند. الگوهای متفاوتی از جمله تفاسیر مبتنی بر مدل‌های بیماری هلندی، الگوهای رانت جویانه، مدل‌های حمایت و تفاسیر نهادی برای توجیه و یا توضیح پدیده نفرین منابع طبیعی طراحی گشته‌اند. آنچه امروزه به عنوان یک اجماع مورد پذیرش قرار گرفته آن است که میزان منابع طبیعی یک کشور نمی‌تواند نشان‌دهنده ظهور و یا وجود پدیده نفرین منابع طبیعی باشد و آنچه این پدیده را به وجود می‌آورد، نهادهای ناکارآمد و حکمرانی بد در کشورهای صاحب منابع غنی طبیعی است. مقاله حاضر تلاش می‌کند تا با بررسی مفهوم و ابعاد توسعه نهادی، نحوه اثرگذاری مؤلفه‌های حکمرانی خوب بر یکدیگر را در کشورهایی که در مخاطره نفرین منابع طبیعی قرار دارند شناسایی نماید و از این مسیر، پیشنهادهایی برای بهبود کیفیت نهادی در این کشورها ارائه دهد. یافته‌های این تحقیق نشان می‌دهد که در کنار روابط وسیع علی میان مؤلفه‌های حکمرانی خوب، دو شاخص کنترل فساد و کیفیت قوانین و مقررات دارای اولویت‌های نخست در افزایش کیفیت نهادی کشورهای در مخاطره منابع طبیعی هستند. این بدان دلیل است که دو مؤلفه فوق بیشترین اثر علی را بر دیگر مؤلفه‌های حکمرانی خوب می‌گذارند، در حالی که کمترین تأثیر را از آن‌ها می‌پذیرند. Sachs and Warner (1995) proposed "Natural Resource Curse" hypothesis that believed natural resource-rich countries have lower growth rate relative to the others. Different models like Dutch disease, rent seeking, patronage, and destruction of institutions have been designed to explain the hypothesis. The emerging consensus believes that natural resource abundance is not the determinant of cursing or blessing of natural resources. In fact, what is the key driving force is the institutional quality of countries. The current paper investigates the causal relationships between the elements of good governance in the countries at the risk of natural resource curse to find a road map for the countries that want to escape or prevent from this curse. The paper reveals that two elements of good governance, i.e., control of corruption and regulatory quality, have higher priorities than the others due to their casual impacts. رحمانی، تیمور؛ گلستانی، ماندانا؛ (1388)، «تحلیلی از نفرین منابع نفتی و رانت‌جویی بر توزیع درآمد در کشورهای منتخب نفت خیز»، مجله تحقیقات اقتصادی، 1388، شماره 89. مهدوی عادلی، محمدحسین؛ حسین ‌زاده بحرینی، محمدحسین؛ جوادی، افسانه؛ «تأثیر حکمرانی خوب بر جذب سرمایه‌گذاری مستقیم خارجی در کشورهای با درآمد متوسط»، دانش و توسعه، 1387، شماره 15. 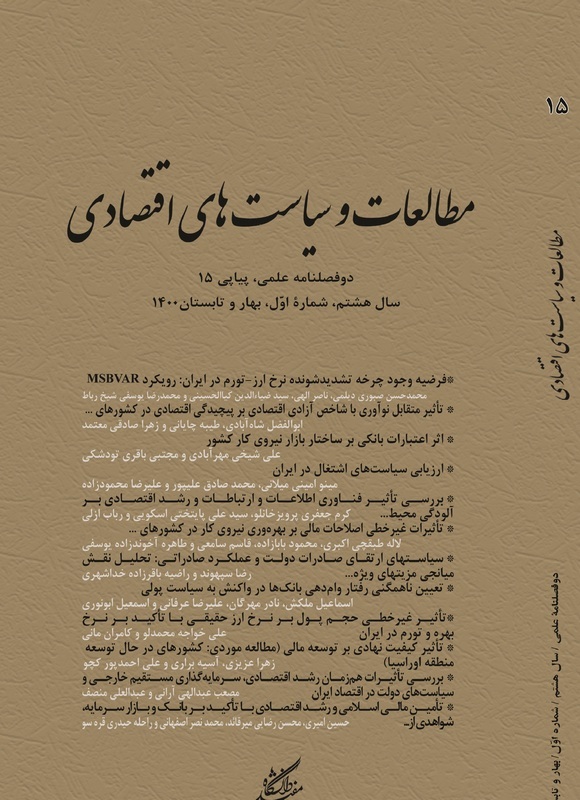 میدری، احمد؛ «مقدمه‌ای بر نظریه حکمرانی خوب»، فصل‌نامه رفاه اجتماعی، 1385، شماره 22. Andersen, J.J; Aslaksen, S; "Constitutions and the resource curse", Journal of Development Economics, Vol. 87, 2008. Anderson, T.W;Hsiao, C;"Estimation of dynamic models with error components", Journal of the American Statistical Association, vol.76, 1981. Arellano, M; Bond, S; "Some Tests of Specification for Panel Data: Monte Carlo Evidence and an Application to Employment Equations", Review of Economic Studies, Blackwell Publishing, vol. 58(2), 1991. Atkinson, G; Hamilton, K; "Savings, growth and the resource curse hypothesis", World Development, Vol. 31, 2003. Auty, R.M; Resource abundance and economic development, Oxford University Press, 2001. Baltagi, B.H; "Econometric Analysis of Panel Data", John Wiley & Sons Publication, Second edition, 2001. Brunnschweiler, C.N; "Cursing the Blessings? Natural Resource Abundance", Institutions, and Economic Growth, World Development, Vol. 36, Issue 3, 2008. Brunnschweiler, C.N; Bulte, E.H; "The resource curse revisited and revised: A tale of paradoxes and red herrings", Journal of Environmental Economics and Management, Vol. 55, Issue 3, 2008. Bulte, E.H; Damania, R; Deacon, R.T; "Resource intensity, institutions, and development", World Development, Vol. 33, Issue 7, 2005. Caselli, F; Cunningham, T; "Political decision making in resource abundant countries", Paper prepared for the OxCarre launch conference, 2007. Harford, T; Klein, M; "Aid and the resource curse", The World Bank Group, Private Sector Development Vice Presidency, Note 291, 2005. Hartwig, J; (2010), "Is health capital formation good for long-term economic growth?-Panel Granger-causality evidence for OECD countries", Journal of Macroeconomics, Vol. 32, Issue 1, 2010. Hirschman, A.O; The Strategy of Economic Development, New Haven, Yale University Press, 1958. Hodler, R; "The curse of natural resources in fractionalized countries", European Economic Review, Vol. 50, Issue 6, 2006. Holtz-Eakin, D; Newey, W; Rosen, H.S; "Estimating Vector Autoregressions with Panel Data, Econometrica", Econometric Society, vol. 56(6), 1988. Karl, T; The paradox of plenty: Oil booms and petro-states, University of California press, 1997. Kaufmann, D; Kraay, A; Mastruzzi, M; "Governance Matters VIII: Aggregate and Individual Governance Indicators 1996-2008", The World Bank, policy Research, 2009, Working Paper No. 4978. Kolstad, I; Wiig, A; It's the rents, stupid! The political economy of the resource curse, Energy Policy, 2009, Vol. 37, Issue 12. Kolstad, I; Wiig, A; Williams, A; "Mission improbable. Does petroleum-related aid address the resource curse? ", Energy Policy, Vol. 37, 2009. Mehlum, H; Moene, K; Torvik, R; "Institutions and the Resource Curse", The Economic Journal, Vol. 116, 2006. Olsson, O; "Conflict diamonds", Working papers in Economics 86, Department of Economics, Goteborg University, 2003. Olsson, O; "Geography and Institutions: A Review of Plausible and Implausible Linkages", Göteborg University, Department of Economics, Working Papers in Economics, 2005, No. 106. Robinson, J.A; Torvik, R; Verdier, T; "The Political Foundations of the Resource Curse", Journal of Development Economics, Vol. 79, 2006. Ross, M.L; "Does oil hinder democracy?, World Politics", Vol. 53, 2001. Sachs, J.D; Warner, A.M; "Natural resource abundance and economic growth", NBER working paper, 1995, No. 5398. Sachs, J.D; Warner, A.M; "Natural resources and economic development: The curse of natural resources", European Economic Review, Vol. 45, 2001. Stevens, P; Dietsche, E; "Resource curse: An analysis of causes", experiences and possible ways forward, Energy Policy, Vol. 36, Issue 1, 2008. Tornell, A; Lane, P. R; "The voracity effect", American Economic Review, Vol. 89, Issue 1, 1999. Torvik, R; "Natural resources, rent seeking and welfare", Journal of Development Economics, Vol. 67, Issue 2, 2002. Wick, K; Bulte, E.H; "Contesting resources-rent seeking, conflict and the natural resource curse", Public Choice, Vol. 128, 2006. Williams, A; "Shining a Light on the Resource Curse: An Empirical Analysis of the Relationship between Natural Resources", Transparency, and Economic Growth, World Development, Vol. 39, Issue 4, 2011.